After having this book recommended to me, I was extremely disappointed. Don’t get me wrong. It’s not that it isn’t exciting. It’s not that Mr. Bacigalupi doesn’t drive a high-caliber story. And it’s not that he doesn’t create quality characters. But it’s sinister, gory, and Mr. Bacigalupi can’t go one paragraph without the word d—. He can’t seem to show frustration, anger or emphasis any other way. The world in which Nailer lives is unforgiving and harsh. He earns a living by risking his life crawling inside the ducts of extinct oil ships from the Accelerated Age, piecing them out for scrap. He’s lucky to have work at all. Everything is recycled in this new age, but a life isn’t worth a handful of sand. Loyalty is far and away the most important human quality of all. Without someone you can trust to watch your back, you’re dead. Then one day, a hurricane blows in a Lucky Strike, a yacht worth more than Nailer will see in ten lifetimes. If only he and Pima can scavenge the galley silver before anyone else discovers the wreck, they can escape the shipyards and never look back. But the yacht holds one survivor. A rich girl. A swank in need of help. Pima encourages Nailer to kill her and save his own life with her wealth, but Nailer can’t. His compassion embroils him in a fierce clan war that nearly costs him the one thing he can claim as his own–his life. 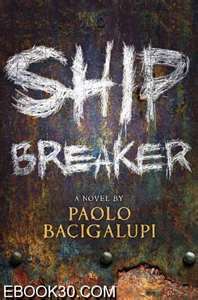 Ship Breaker is a dark story in a dark, futuristic time period when climate change also changes the face of the land and shifts power. Men have created half-men, creatures made with the genetics of humans, dogs and tigers. Cities are flooded, rotted and crawling with poor squatters. New technology includes clipper ships with parasails that capture the jet streams–nothing runs on oil. And people worship just about any diety they can make up. Rust gods, scavenge gods, luck, the Fates. It’s a bleak place. In this new world, violence is the rule. Along with excessive, excessive profanity, this book also includes graphic, sickeningly bloody scenes of murder. Honestly, some pages turned my stomach. And this is marketed to kids? Yes, it is. And highly praised by the sci-fi community. I, on the other hand, will not be recommending it. Sounds kind of creepy too! It is. I had to force myself to finish this one so I could write a review thorough enough to back up my non-recommendation.